The Fonseca No.1 is a delicious, mellow and flavorful Cuban smoke, of Cazador format, 43 ring gauge, 6.4" (162mm) long and comes in box of 25 cigars. Perhaps the most-known Fonseca, it is a must try for any Habanos aficionado, it has a huge fan base that praise its odd format, its mild to medium body full of flavors. Very well manufactured, it is a small gem. •	This is the most popular Fonseca. •	A medium bodied smoke ideal for an afternoon break. Milder than most Cuban cigars it is still full of sophisticated, complex flavors. A very nice brownish wrapper with very tiny veins that has a soft touch. The triple cap is perfect. The pre-light draw is of light hay and chocolate. The burn is even and sharp and the ash holds firm. The draw is smooth and easy but not too loose. The initial third starts with sweet touches of nuts and cream, the aromas surely sweet but there is a decent pinch of salt bitterness as well. It is a delight. 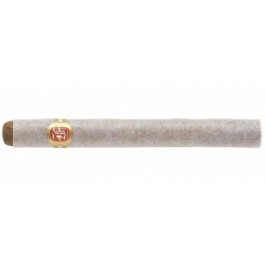 During the second third, you are surrounded by a dense and milky smoke coming from the cigar. The major flavors are of salted nuts. Delicious. In the final third, the cigar flavors evolve and the coffee and cream aromas now stand out. Nevertheless there is a distant sweetness sporadic flower taste hints. In summary, these Fonseca No 1’s are a joy to smoke. They are under appreciated.